With a rainbow trout stocked 65-acre reservoir, campground, boat launch and picnic facilities, Echo Canyon State Park is a popular area in Lincoln County. The 1,080-acre park is open year-round but at 5,200' in elevation, it does see snow and below-freezing temperatures in the winter. Many of the rock formations in the park are the result of volcanic activity 45 to 125 million years ago. About 1 million years ago, this area was covered by a large, fresh-water lake. The draining and drying up of that lake left beds of pinkish clay (bentonite) and alluvial gravel that erode easily into some fantastic shapes. There are also some large veins of chalcedony (desert rose) in the area of that old lake bed. The campground offers 33 sites on a first come, first served basis. The campground has flush toilets and an RV dump station with drinking water available near each campsite. The camping limit of 14 days in any 30 day period is strictly enforced. There are 6 sites along the reservoir's shore that offer picnic tables and BBQ grills. The 2.5 mile long Ash Canyon Trail begins near the upper edge of the campground. From there it climbs some 800 feet in about 1/3 mile to reach the canyon rim before crossing the ridge and descending into Ash Canyon. 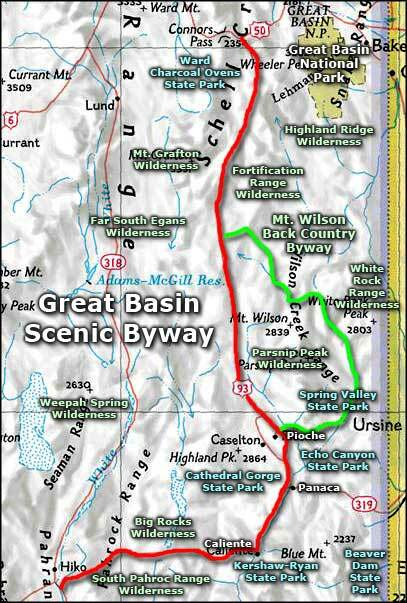 Eventually it intersects with the highway in Rose Valley near the eastern park entrance and then returns to its beginning through Echo Canyon. There is a brochure available for those who want to know what the numbered posts along the way refer to. 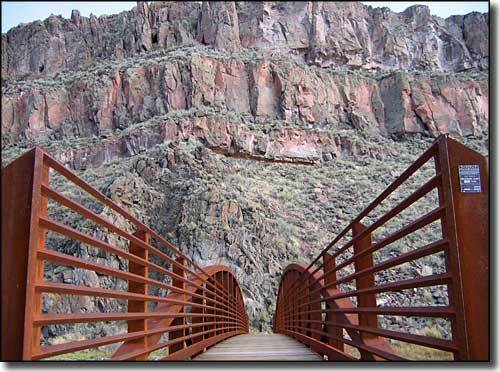 Echo Canyon State Park is reached via State Routes 322 and 323, about 12 miles east of Pioche. Pioche is also the nearest place for gas, groceries and fishing licenses. In hiking around at Echo Canyon State Park you may come across prehistoric artifacts. Archaeologists think the area was used by the ancients up to 7,500 years ago but with no permanent settlements found, the ancients probably used this area for seasonal hunting and gathering. There are also some more recent petroglyphs and other artifacts found on the property that were left by more modern Shoshone tribes, including the Southern Paiute. Mormon pioneers settled in the area in 1864, and it was because of their agricultural endeavors that the Echo Canyon Dam was finally built for water storage and flood control purposes in 1969-70. Entry fees: $7 per vehicle per day for non-Nevada residents, $5 per vehicle per day for Nevada residents. Camping fees: $17 per site per night for non-Nevada residents, $15 per site per night for Nevada residents. Boat launch fees: $10 per boat for non-Nevada residents, $8 per boat for Nevada residents. Camp/Boat Combo: $20 per day/night for non-Nevada residents, $18 per day/night for Nevada residents. Group Picnic Shelters: $15 + normal per vehicle fees. Group Campsites: $15 + normal per vehicle fees. Upper photo of Echo Canyon Reservoir courtesy of MojaveNC. Lower photo of Ash Canyon courtesy of Jody Gibney, via Nevada State Parks.